Like it or not — and I know that some of you don’t — tablets are changing the way the world works and plays. Whether it’s an iPad, Kindle, Nook, or a tablet based on Google’s Android OS, mobile devices are swirling across the computing landscape. Here’s how to pick the right one. Don’t believe that mobile devices are taking over? Consider these eye-popping numbers. And where is Microsoft? Well behind the curve, at this point. Any significant rival to the iPad is tied to the launch of Windows 8. We probably won’t see low-powered Win8 tablets until early 2013 — an eternity in a market that’s already exploding. About the time Microsoft gets a true iPad competitor out the door, Apple will be rolling out its fourth-generation iPad 4. 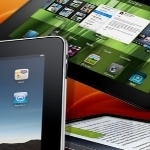 And tablets based on Google Android 4 — or version 5 or 6 — will be commonplace. Microsoft may be behind in its tablet technology, but it obviously knows that a sea change is under way. As it focuses on Win8 and the Metro user interface, the company is starting to refer to traditional Windows applications as legacy apps and the Windows desktop as the legacy desktop. That’s not to say we’re approaching the post-PC era just yet — no more than we’re into the post-combustion engine era. PCs will have a place for a long time to come. But that place is no longer the undisputed center of the computing universe. And PCs are certainly not the center of computing innovation. Just as many of us moved from DOS to Windows, from desktops to portables, and from printed and faxed documents to the Internet, tablets are becoming an important addition to our digital life. So let me step you through the current options, from the point of view of a long-in-the-tooth Windows veteran. Windows Secrets tablets, windows secrets. permalink. Star wars is getting closer with these things all the time. What's next, Tricorders?